Authentic atmosphere with Spanish-speaking staff from Cuba.Salad and appetizers were exellent.... and the Lechon Asada (roasted pork)...... Fish Tacos, Shrimp n Ajilo Tostones & Yellow Rice and Happy Hour Sangria. Thin sliced, fried plantains (tostones) topped with marinated chicken, beef or pork & covered with Fernandez cheese sauce. Make this vegetarian by substituting black beans for meat choice. Traditional ham croquetas that are breaded and fried until golden brown. Served as an order of four. These little poppers are stuffed with jalapeño and cream cheese. Served with spicy ranch for dipping. Traditional spanish style tamal. Hand rolled & served with our famous Fernandez hot sauce. Bite size‏ Calamares are breaded then fried crispy. Served with our home-made seafood sauce for dipping. This tasty dish is big enough to share. Our version of an old favorite. Chicken wings are tossed gently in your choice of sauces. Famous Fernandez hot sauce, garlic hot sauce or BBQ Sauce. Beer battered mozzarella cheese, fried golden brown. 5 per order. Served with ranch sauce for dipping. Made fresh all day. Thinly sliced plantains are cut long then fried until golden & crunchy. Served with homemade garlic sauce for dipping. Toasted house made Cuban bread is topped with our famous slow roasted pork, avocado slices, diced tomato and onion then drizzled with olive oil. Served 3 pieces to order. Make this vegetarian by substituting black beans. Three large pieces of stuffed Yuca are filled with delicious seasoned beef and pork served with our famous Fernandez cheese sauce. 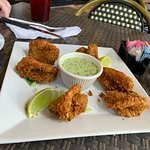 Fresh greens‏ with a unique combination of sliced chorizo & pork with tomato, cucumber, carrots, onion, peas, capers & topped with our famous Fernandez hot sauce. Slow marinated chicken breast is sliced over fresh greens, tomato, carrots, cucumber, onion, capers & white American cheese. Served with your choice of dressing. Sirloin steak is grilled to your taste and served on bed of mixed greens with tomato, cucumber, carrots, onion, capers & white American cheese. Our delicious Churrasco style chicken is grilled, sliced and served over mixed greens with tomato, cucumber, onion, capers, carrots & white American cheese. 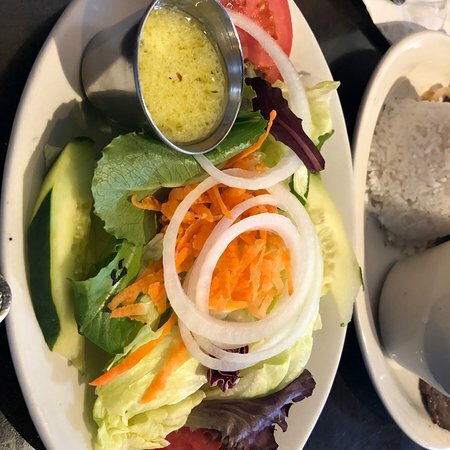 Our mouth watering Churrasco steak is grilled, sliced & served with mixed greens, carrots, tomato, cucumber, onion, capers & white American cheese. Best with house dressing. Mixed greens, tomato, cucumber, carrots & onion topped with sliced ham, chorizo and white American cheese. Fresh mixed greens topped with tomato, cucumber, onion, capers, carrots & white American cheese. Cuban style garbanzo bean soup. Blended with chorizo & seasoned in Spanish tomato sauce. (Slightly spicy). 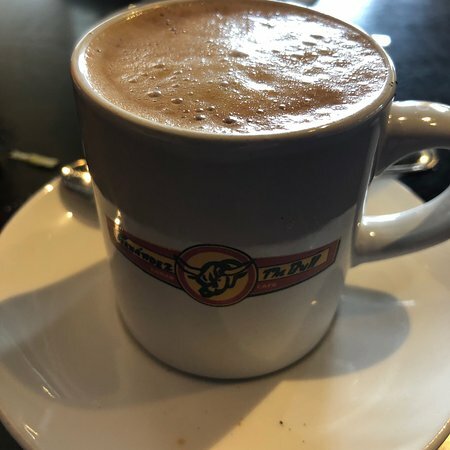 We start from a dry bean and give it time to soak up the authentic cuban seasonings. Served with diced, raw onions on top. Blending two of our favorite things, homemade Picadillo, black beans and a touch of our famous hot sauce to create a black bean chili. Perfect even in warm weather. All entrees come with choice of 2 sides. Black Beans, White Rice, Yellow Rice, Side Salad, Sweet Plantains, Tostones, Boiled Yuca, Fried Yuca, Moros, French Fries. 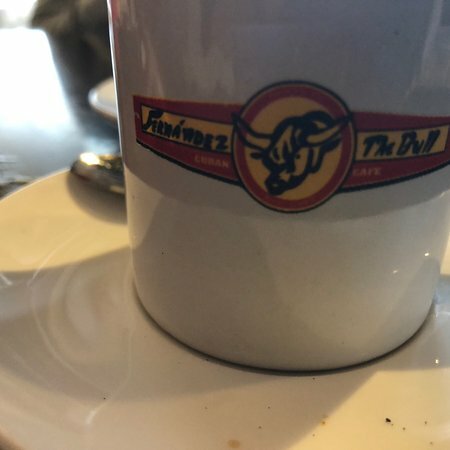 El Torito. AKA The little bull. Filet de Costilla: One of the most flavorful cuts of steak. This 18Oz Latin cut rib eye steak is juicy and tender grilled to perfection. Served with side of Chimichurri. Slow cooked, seasoned ground beef blended with Spanish Tomato Sauce, chopped onion & red pepper. Tender flank steak that has been slow cooked in the flavors of garlic & lemon. Served with grilled onions. Perfectly seasoned Churrasco steak is seared to bring out mouth watering flavor then topped with our chef’s famous chimichurri sauce. Thin steak that is deeply marinated in garlic lemon sauce. Served with grilled onions. An old favorite, this thin cut steak is marinated & breaded then fried to golden brown. Served with diced, raw onions on top. 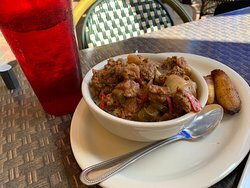 Translated as old clothes, this old Cuban favorite is shredded flank steak cooked in light Spanish tomato sauce with onions and red & green peppers. 8oz Filet, Hand trimmed and grilled to perfection., Topped with our Homemade Compound Chimichurri Butter. Served with 2 sides. Slow roasted‏ pork is marinated and cooked until tender. Then grilled and cooked to order & basted in garlic & lemon sauce. Marinated center cut pork chops pan fried then topped with garlic & lemon sauce. Pork chunks that have been marinated & slow cooked then fried. Topped with our Mojo sauce and sliced onions. Boneless chicken breast, butterflied thin & marinated in our mojo sauce. Seared and topped with grilled onions. Slow marinated half chicken is roasted then flash fried to seal in flavor. Lastly is quickly grilled & basted in Mojo & garlic sauce. Boneless chicken breast cut Churrasco style then grilled. Topped with our chef’s special chimichurri sauce. Boneless chicken breast is seasoned in garlic & lemon sauce then hand breaded & fried golden brown. Topped with our famous Fernandez cheese sauce. One of our most famous dishes created just for you. Blends seasoned yellow rice as a bed for shrimp, scallops, clams, mussels, crawfish, chicken and chorizo. Lightly mixed with red peppers & sweet peas. Served with one side. Please allow additional cooking time for this dish. Filet of‏ flounder is hand breaded to order then pan fried with garlic & lemon to bring out flavor. Topped with our homemade cilantro garlic sauce. A perfectly seasoned & grilled Churrasco steak is made even more delicious by topping it with garlic sauteed shrimp. Served with side of chimichurri sauce. Combining delicious flounder Fernandez as a base, we top that with shrimp sauteed in a blend of lemon garlic sauce and a light touch of our Fernandez cheese sauce. Spanish style creole sauce is blended with Shrimp to create this flavorful dish. Plump shrimp sauteed in perfect blend of white wine & garlic sauce then topped with capers. This is a house favorite. Scallops & shrimp are mixed & sauteed in white wine & garlic sauce then topped with capers. Shrimp & Mussels combined with spanish white wine and tomato sauce. Topped with capers. A tasty, light, white fish that can be grilled or fried. Served with homemade spicy, mango salsa. Served with 2 sides. Gold & crunchy plantains that have been sliced, cooked, then smashed & fried until golden brown. Served with lemon garlic sauce. If you like black beans and white rice you will love this flavorful side. We cook our home made black beans with white rice and add additional seasoning as well as fresh chicharrones for extra flavor. This potato like side is boiled until soft then covered in fresh seared garlic sauce. Also known as Yuca Frita, this tasty favorite is the crunchy, fried version of boiled yuca and is served with lemon, garlic sauce for dipping. Mixed greens, tomato, cucumber, carrots & onion. 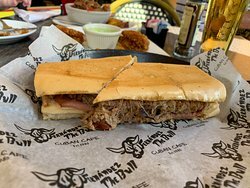 The original our very own Cuban sandwich served only here since 1985. Our famous slow roasted, shredded pork is served with sliced ham, white American cheese, pickle & mustard. Pressed until gold & crispy. The "traditional" style Cuban sandwich with stacked ham & thin layer of roasted pork, swiss cheese, mustard, mayo & pickles. Served with mariquitas. This new sandwich was created in honor of our long history in Naples. If you thought a Cuban Sandwich couldn't get any better, try this one out with 4 delicious strips of smoky bacon. Served with side of fries. Media noche. Same as Fernandez Cuban sandwich but with sweet bread. Pressed until gold & crispy. Full slow-roasted pork sandwich with grilled onions & potato sticks. Pressed until gold & crispy. 3-Mini burgers served with lettuce, tomato, onion and mayo. Served with fries. Created for Roger, Luis’ Best friend, who asked for something different. Adding chorizo to cuban bread with grilled onions and white American cheese. Topped with Fernandez hot sauce, potato sticks. Served on pressed Cuban bread. 3 Flat‏ bread pitas with your choice of chicken, picadillo or roasted pork. Topped with fresh pico de gallo, drizzled with our chef’s homemade chimichurri sauce. Served with rice and beans. Make this vegetarian by substituting black beans for meat choice. Our version of a Philly with shredded pork, grilled onions and melted cheese served on toasted cuban bread. Your choice of white American, swiss cheese or Fernandez cheese sauce. Served with Fries. Ham croquetas and white American cheese served on pressed Cuban bread. Filet of flounder pan fried and topped with garlic cilantro sauce. Served with black beans & rice. Lunch portion Palomilla Steak served with black beans and rice. Roasted quarter chicken served with black beans & rice. 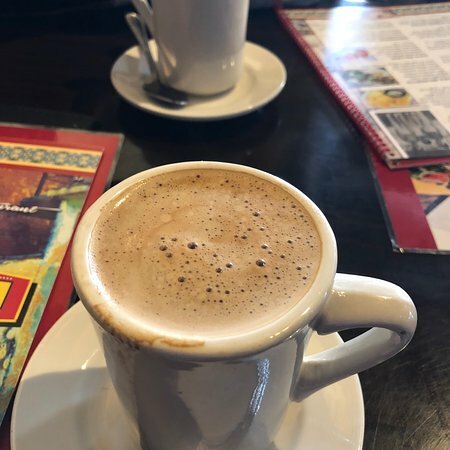 We are Naples Oldest and Original Cuban restaurant serving our Families recipes for over 30 years. Please join us for your old favorites or try one of our new creations. Had an excellent lunch with tasty sandwiches and side dishes. We had the plantain and it was delicious. We try to go to this restaurant every time we visit the Naples area. 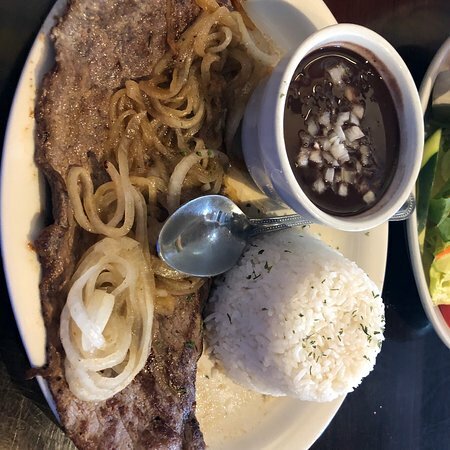 Outstanding Cuban Cuisine and Juicy steaks! Great spot if you are looking for a good cut of meat which will not break the bank. The chimichurri sauce and the appetizers complement any meal here. Definitely recommend for families and more casual night if you are in the area! Beef was EXCELLENT. Everything else not so much. My family and I have never experienced Cuban food. Everything was really good. Our overall experience with the service and food was positive. No complaints. Would eat here again when visiting. Food is so good but you failed again with service.. 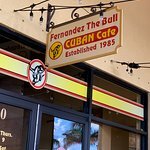 I love Cuban food and come here to eat every time I visit Naples. Everything I have tried is very tasty. 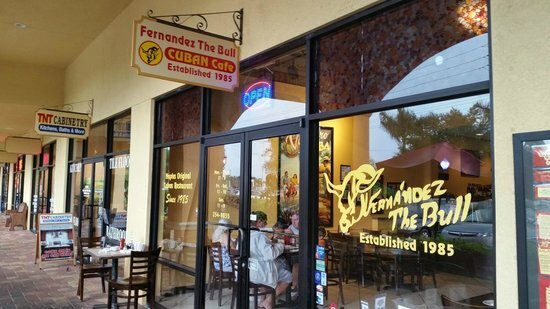 Get quick answers from Fernandez the Bull Cuban Cafe staff and past visitors. Hi I need to know if you can do a grill pork for 40 to 60 pounds for delivery or pick up. Yes we can, please go to our website for complete catering menu. You can also place your catering order through our website. If you have any questions please feel free to call 239-254-9855 or 239-653-9097 thank you..